The B-52s – American Tour Am I dreaming this? We are pleased to announce that we will be the very special guests of The B-52s for their North American tour this August and September. Completing the lineup will be Berlin. We will also be playing four headline shows during the break of the B-52s tour around Labor Day. OMD Supporting the B-52s and Berlin? We are delighted to announce the UK & European legs of the “Souvenir – OMD 40 Years” Tour. We will be celebrating our 40th Anniversary by playing all of our hits and more, including some rarely played early material. VIP Packages/Upgrades will be on sale at 9am on Tuesday 12th March from here. Tickets will be on sale at 9am on Thursday 14th March from here. VIP Packages include access to soundcheck in the afternoon, the very best seats in the house (or priority entry at standing venues), a year’s membership of the OMD Access All Areas app (further details to be announced soon), a signed setlist, an exclusive T shirt, a souvenir ticket and a VIP laminate pass. New for this year, a very limited number of exclusive backstage tours are also available at each venue. For the UK and Ireland, VIP Packages include a ticket for the evening show and are priced at £100/£200 and will be available from here. For shows in the rest of Europe, the VIP Upgrade does not include the evening ticket (but still guarantees early entry to the evening show when a ticket to the evening show is purchased). The VIP Upgrade is priced at €70/€186 and will be available from here. We are thrilled to announce that our first four albums (Orchestral Manoeuvres in the Dark, Organisation, Architecture & Morality, Dazzle Ships) will be reissued on vinyl via Universal Music Catalogue on 2nd November this year. This is the first time that these records have been reissued on vinyl since the 1980’s. The records have been specially remastered at half speed by Miles Showell at Abbey Road Studios, and they come housed in their original iconic die cut sleeves designed by the legendary Peter Saville. A bundle of all 4 records is available to pre-order on our official store. This bundle includes a free OMD 40th anniversary tote bag, exclusive to the online store. We are pleased to announce that we will be recording and releasing our shows with the Royal Liverpool Philharmonic Orchestra next month. The various products are available for pre-order now. “On The Night” 6th October 2CD & “On The Night” 7th October 2CD – A full, uninterrupted recording of the show. Available in the days following the show. A money-saving bundle of the “Best Of” 2CD and 3LP formats is also available. Additionally, those attending the shows can purchase the “On The Night” CDs from the venue. We are pleased to announce the publication of the book Pretending To See The Future, in celebration of the band’s 40th anniversary. The book is now available to pre-order from PledgeMusic. All early pre-orders from Pledge will also receive an exclusive flexi-disc featuring a very rare and previously unheard demo of Messages from the summer of 1978 before Andy and Paul actually formed Orchestral Manoeuvres in the Dark. Recorded in the garage studio of school friend Paul Collister who would become OMD’s manager, and featuring the electronic drums built by Paul Humphreys. This is sound of two eighteen year old kids experimenting in early electronic music and still exploring the arrangement of a song that would become the band’s first hit single two years later. The flexi-disc will be made to order for the initial orders and will not be available elsewhere. Order now to avoid disappointment. Submissions for the book are still being accepted at [email protected] – please send your own stories of notable memories of seeing the band in concert. OMD Book – we need your help! We are delighted to announce that a new book about OMD is being published later this year by Red Planet Publishing, and we want you to be a part of it. Pretending To See The Future (provisional title) will tell the story of OMD from the band’s beginnings to our latest tour. Featuring memories from Andy and Paul and some of the many people they have worked with over the years, we also want to hear your memories. Tell us how and when you discovered the band’s music and your concert memories, including where and when you saw them. We’ll feature the best stories in the book. We can’t wait to read them! We are thrilled to announce the first of our 40th Anniversary celebrations! We will be returning to the Royal Liverpool Philharmonic this year for a pair of concerts with the Royal Liverpool Philharmonic Orchestra on 6th & 7th October. These dates coincide with the anniversary of our first gig which took place at Eric’s in Liverpool in October 1978. The concerts will see Andy McCluskey & Paul Humphreys accompanied by the orchestra performing some of OMD’s large scale ambient tracks such as “Stanlow”, “Sealand” and “Ghost Star”. Also featuring in the performance will be material from the recent album “The Punishment of Luxury”, rare B-sides and songs that have never been played live before, as well as some of the classic hit singles. There will also be a performance of a new instrumental piece entitled “And Then She Saw The Minotaur” from an as-yet unreleased film soundtrack. Tickets will be on sale from 10am on Thursday 22nd February from here. Alternatively they will be available from 9:30am on the booking like 0151 709 3789. VIP packages including the best seats in the house will also be available at this time. 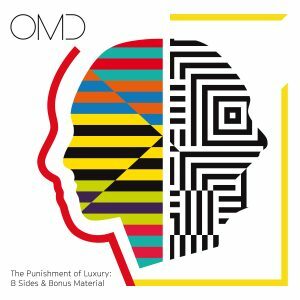 We’re delighted to announce the CD and digital release of The Punishment of Luxury: B Sides & Bonus Material! It will be released on 15th December. The tracklisting collects together all of the B sides, radio edits, extended 12″ mixes and remixes from The Punishment of Luxury era and brings them to CD for the very first time. We will be doing an online vote at each show this year. Two songs will be offered and the winner will be added to that evening’s setlist. The songs offered each day will change. The online vote can only be accessed with a password which will be displayed at the merchandise desk at each show. It will close at 8pm each night so that the votes can be counted and the band can prepare before they take to the stage. Exact details of how to vote will be posted here on the official OMD site, and also at the merchandise desk. We’re looking forward to including some rarely-played songs! We are excited to announce the North American leg of The Punishment of Luxury Tour. All dates will be on sale at 10am local time on Friday 22nd Sept (except Milwaukee which will be on sale at 12 noon local time on Saturday 23rd). Ticketing details can be found on our Shows page. VIP Upgrade packages including meet & greet with the band, access to soundcheck, signed setlists & other exclusive merchandise are also available – these must be purchased separately to tickets for the show itself. These are available for purchase now.